Telangana State Road Transport Corporation (TSRTC) bus passes will be issued from across the Telangana from 18-06-2017 to students of Government and Private Educational institutions. In previous year, all the bus passes candidates filled the form and applied to the bus pass counter in the nearest Bus stand and entered the computer. From this academic year, there is no queue system. All steps have been taken to issue the bus passes through online mode @ https://online.tsrtcpass.in/. 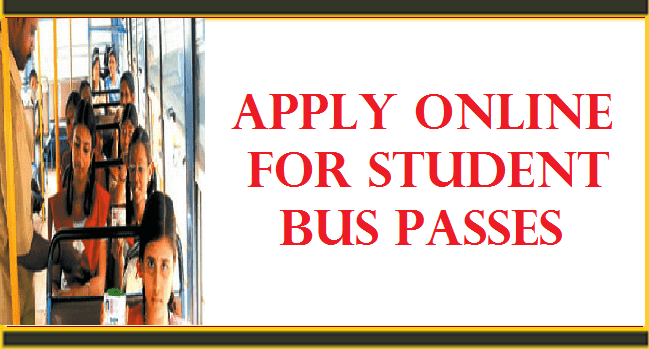 Students first visit to the TSRTC official website: http://www.tsrtcpass.in/ and students to register their biodata. So, the students and parents should visit the nearest internet centers, online centers, meeseva centers and enroll your details these centers after registration process, a message to be received to the cellphone. After getting the registration receipt and show it at bus pass counter and you need to get bus pass in the Bus pass counter . Any change in Name, Address and Courses of the Educational Institution (Schools/Colleges) shall be intimated to TSRTC immediately and to submit the relevant documents to update the same against the institution code in online. The entire image consisting of the photo along with the signature is required to be scanned and stored in *.jpg format on local machine. Ensure that the size of the scanned image is not more than 50kb. If the size of the file is more than 50kb, then adjust the settings of the scanner such as the dpi resolution, no. of colours etc., during the process of scanning. Tags: Apply Online for Student Bus Passes, TSRTC Bus pass web portal, www.tsrtcpass.in, Apply Online for Student Bus Passes, Apply Student Bus Passes Online, District Bus Passes for students, Student Pass above SSC, Student Pass upto SSC, Online bus passes are issued from today from Pass Automatic Accountal System, TSRTC Bus Pass Student Online registration web portal, https://online.tsrtcpass.in/, TSRTC Bus Pass Web portal, www.tsrtcpass.in, Student Bus Pass Online application form for Above SSC Students, Student Bus Pass Online application form for upto SSC Students, Student Bus Pass Online application form for Students of Hyderabad and surrounding District Areas.